Buying a spin bike is a great way to get a spinning workout or do cycling training in the comfort of your home without having to battle with traffic or be at the mercy of the gym schedule or other users. When looking for a bike for your home you want one that can give you the right basis for workouts of your choosing and then won’t cause any other issues in the home. 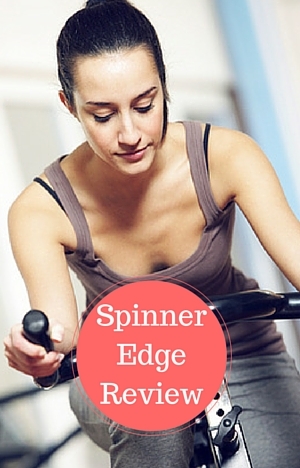 Looking at the Spinner Edge is great place to start when you’re serious about your workouts. It has a heavy flywheel, has a heavy construction, is adjustable to fit a number of different heights and sizes. This all makes it worthwhile contender for your bike of choice. 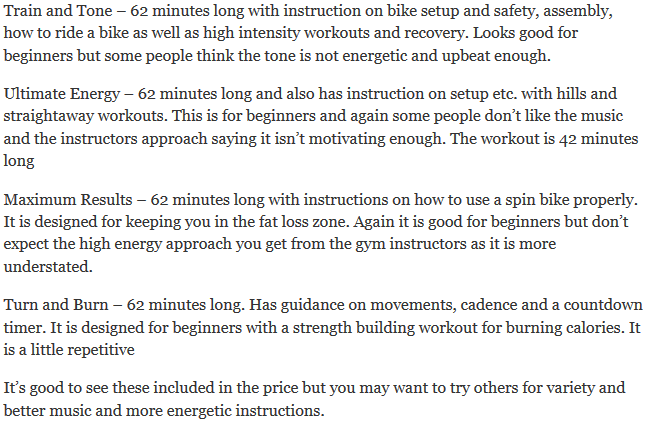 In this review we look at how these factors measures up to give a quality workout plus whether it fits well in a home. The first area to look at is how well it does in keeping you steady while you perform your workout and training. This leaves you to be able to just concentrate on your workout and not be concerned that you might be tipped off. The flywheel weighs 43 lbs and is perimeter weighted to give a natural cycling motion. It stops the up and down motion that you get on light flywheels as it pulls the pedals around the whole cycle especially if you are new to cycling or spinning. This results in less stress on your joints and can help when you are recovering from a joint injury. Under the stabilizer bars are 4 levelers that can be used to stop the bike from rocking if the floor is uneven. The seat can be adjusted up/down and back/forward to get the bike to fit you properly for the most effective workout. The handlebars can only be more up/down. To do the adjustments is quick. The first time you do this it may take a little extra time to get the bike to fit properly. Once you’ve got the setting there are markings on the adjustment poles you can use to reset the bike if it has been adjusted since you last rode the bike. In the adjustment poles are pre-set holes that you use to adjust the seat and handlebars into position by sliding them up and down and tighten the pull-pin levers to hold them in place. To move the seat forward/backwards it is on a slider that you can move to where you want and tighten in the exact position you want. They call this micro adjusting giving you to move it by just a millimetre if you want. The speed of adjustment makes it a bike the whole family can use as each person can quickly adjust it if they need to and get on with their workout. The bike can be sized to accommodate people between the heights of 4 ft 10 ins and 6 ft 8 ins. The bike uses a friction resistance pad to increase the hardness of cycling like you get when going up a hill. This is done by turning the tension knob situated just below the handlebars. The knob control how hard the resistance pad resting on the flywheel pushes on to the flywheel to give greater or lesser resistance. It is made of leather which increases the lifespan of the pad. It grips the wheel uniformly so there is no slipping as you cycle or variations in resistance. As you’d expect the tension knob allows you to increase or decrease the resistance from easy to very difficult. The increases or decrease are gradual so you can turn it to the amount of resistance you want. There are no resistance levels marked so you do need to estimate or guess if you want to return to previous setting if resistance has been changed. To increase the longevity of the pad and the flywheel there is a guard over them to stop sweat dripping on to them. The pad will need replacing in over a year’s time depending on usage and the supplier can be contacted direct for replacements. They can be replaced by the user and the instructions are included in the owner’s manual. The Spinner Edge uses a chain drive like you see on a road bike. It gives you an experience closer to those type of bikes as you pedal along with similar noise and maintenance (although it needs less due to it being used inside). There is light clinking sound as the chain moves across the sprockets. From time to time the chain may require tightening if it become loose or lubricating. It’s not difficult to do and the instructions are in the owner guide. The chain is protected by a guard that stops sweat dropping on it, to prevent it rusting. The guard also helps to protect your ankles and clothes getting caught in the chain. It also helps to keep the chain noise a little quieter too. The bike has fixed gear so when the flywheel is turning the pedals turn also. The perimeter weighting of the flywheel keeps it turning when you stop pedaling and so do the pedals. It does mean you need to be careful when you want to get off the bike. To dismount the bike you can stop the pedals turning by gently slowing them down with your feet or if you need to get off quickly you can use the resistance pad as a brake pad by pushing down hard on the tension knob. It is usual for spin bikes to have a fixed gear rather than smart release which allows the flywheel to spin independent of the pedals. The only bike I’ve reviewed to date with that functionality is the Schwinn AC Sport which cost another $350. It also uses magnets to provide a noiseless, maintenance and dust free resistance for hill climb type workouts. The pedal are dual sided with one side SPD compatible and the other side being toe baskets with straps for athletic shoes. Both sides give you the grip (with appropriate shoes) to push and pull through the pedal cycle You’ll feet will stay in place whether seated or standing. The pedals q factor is 155 mm – this is the distance between the pedals. This is one of the narrowest q-factors for a spin bike. It allows better alignment from the hips to the feet thereby putting less stress on the joints. In most cases this reduces risk of stress injury to the joints. It also makes the bike feel more like an outdoor bike. Handlebars. The handlebars have foam coating to make them easier to grip especially when hands are wet and to stop blisters forming. They are specially designed to give you the best hand positions for spinning. However, they don’t have aerobars for cycle training in the aero position. Seat. The seat has been contoured to provide a more comfortable experience for your sit bones. However, you may still not find it to your liking as it is like a bike seat. To help with this you can put a gel cover on the seat or wear padded bike shorts. If that doesn’t help or you have a seat you prefer you can change it for any other seat that fits a standard bike. The seat angle can also be adjusted by loosening the nuts under it and tilting to a more comfortable angle and then tightening up to keep in place. Dust and Dirt. It won’t give off too much dirt and dust but there’ll be some. Dust from the resistance pad and lubricant from the chain may drop on the floor. You may also drop sweat on the bike and floor. It is recommended you clean the bike regularly to prevent it rusting from the salt in your sweat – even though the bike has a rust protective coating. To protect your floor from damage a rubber exercise mat is recommended. The design of the bike stops dirt from building up under the bottom bracket so less cleaning is needed. Noise. It is a quiet bike but not silent. You will hear the resistance pad rubbing on the flywheel – it is a shushing noise and a soft clink of the chain. You should be able to use the bike in your home without disturbing anyone else. You may need to turn up the TV a little bit to hear it. The quieter bikes have magnetic resistance and a belt drive which give an almost silent riding experience. These bikes do as a whole cost more. The bike requires an area of 20 ins by 55 ins when not in use for storage. You can fit it under the stairs, or in a large cupboard or against a wall to keep out of the way when not in use. On the front stabilizer bar there are 2 transport wheels that you tip the bike on to for moving it around. They support the weight of the bike so you can just wheel from room to room or to and from the storage area. You shouldn’t have a problem with overbalancing but care should be exercised. The wheels are exposed so there shouldn’t be a problem on carpet. On wooden floors these type of wheels can scratch or dent them when you move them. It’s a good idea to test them out if you have a wooden floor. The bike arrives partially assembled. The tools required to finish the job are included with the bike, Assembly normally takes under an hour. The instructions clearly layout what needs to be done. The task is much easier than putting Ikea furniture together as there are less parts needing to be put together and less hardware. The job involves fiing the stabilizer bars, seat, handlebars, adjustment poles and pedals to the rest of the bike. The most difficult part of the bike assembly is likely to be managing the weight of the bike especially when attaching the stabilizer bars. It is recommended 2 people assemble the bike and it is due to the weight. It weighs 121 lbs. Like many spin bikes and indoor cycles you don’t get a console with the bike to monitor or track your workouts. Instead people use music and follow along to a DVD to keep their RPM and intensity at the required level for their workouts. If you want a console to monitor a workout you can fit standard bike computers to the bike such as those made by Cateye but you do need to modify them to fit, in particular the magnet that is designed to attach to the wheel spokes of a bike. Alternatively for about $100 less The Sole SB700 comes with a console as standard. It fits people between the heights of 4 foot 10 inches and 6 foot 4 inches. The pedals just have toe cages and aren’t suitable for specialist shoes. The bike comes with a dual water bottle holder at the front of the handlebars. This makes water bottle easy to grab as they are in easy reach and also held in place with gravity so no need to force out or back into place while you are riding. Your cycling should hardly miss a beat. The bike also includes 4 workout DVDs which you nned to play through your TV or computer. There are limited reviews online but on the whole they are positive. However one person did state that the bike did come with defects and the replacement parts had the same issue. It appears isolated and is from over 2 years ago. More recent reviews don’t mention it. The other negative is the lack of console and the fact that the console they do supply doesn’t fit the bike. The bike listing doesn’t say it comes with a console but it is a valid criticism of a bike at this price for the home but it can be levelled at a number of bikes. Aside from that the reviews like the quality of the ride you get from the bike and that is similar to a bike you’d use at a gym. You can workout as hard as you want and as often as you want as the bike provides a stable and fluid riding experience. It is good quality bike that gives you the basis for tough workouts and very solidly built. It compares well with other bikes with dual pedals and quality of the build. This is well built bike that will give you a workout as intense as you want for many trouble free years. For the price I’d like to see it come with at least a basic console but I appreciate that isn’t something everybody wants from a spinning bike. The heavy flywheel and chain gives a close riding experience to an outdoor which is natural and low impact. The increments on the resistance allow you to increase or decrease the toughness of the workout to the level you want. The bike is great for beginners who want to take their workout seriously but some may find it a little pricey (as an alternative check out our listing bikes for beginners). With the settings available the same bike can be used by both experienced riders and beginners as they are all quick and easy to adjust. For serious and experienced spinners this is bike is ideal for home use that is similar to the ones you find at a gym.